Today, United States Education Secretary Arne Duncan released a letter stressing the importance of Gay-Straight Alliance Clubs (GSAs) in promoting an atmosphere of understanding and acceptance for LGBTQ students. The letter cites the impact of GSAs in helping to quell anti-LGBTQ harassment and bullying. Equality Florida has long known the important role GSAs play in creating an environment where all students can feel safe to learn. 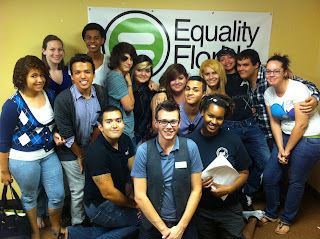 We coordinate and support the largest network of GSAs in the Southeastern United States; The Florida GSA Network. In fact, we just hosted our 2nd annual Greater Orlando GSA Leadership Institute with 20 of Central Florida's most active GSA Leaders. Check out the photo from our training and the exciting letter of support from Education Secretary Arne Duncan below. Harassment and bullying are serious problems in our schools, and lesbian, gay, bisexual, and transgender (LGBT) students are the targets of disproportionate shares of these problems. Thirty-two percent of students aged 12-18 experienced verbal or physical bullying during the 2007-2008 school year;1 and, according to a recent survey, more than 90 percent of LGBT students in grades 6 through 12 reported being verbally harassed — and almost half reported being physically harassed — during the 2008-2009 school year.2 High levels of harassment and bullying correlate with poorer educational outcomes, lower future aspirations, frequent school absenteeism, and lower grade-point averages.3 Recent tragedies involving LGBT students and students perceived to be LGBT only underscore the need for safer schools. Gay-straight alliances (GSAs) and similar student-initiated groups addressing LGBT issues can play an important role in promoting safer schools and creating more welcoming learning environments. Nationwide, students are forming these groups in part to combat bullying and harassment of LGBT students and to promote understanding and respect in the school community. Although the efforts of these groups focus primarily on the needs of LGBT students, students who have LGBT family members and friends, and students who are perceived to be LGBT, messages of respect, tolerance, and inclusion benefit all our students. By encouraging dialogue and providing supportive resources, these groups can help make schools safe and affirming environments for everyone. But in spite of the positive effect these groups can have in schools, some such groups have been unlawfully excluded from school grounds, prevented from forming, or denied access to school resources. These same barriers have sometimes been used to target religious and other student groups, leading Congress to pass the Equal Access Act. In 1984, Congress passed and President Ronald Reagan signed into law the Equal Access Act, requiring public secondary schools to provide equal access for extracurricular clubs. Rooted in principles of equal treatment and freedom of expression, the Act protects student-initiated groups of all types. As one of my predecessors, Secretary Richard W. Riley, pointed out in guidance concerning the Equal Access Act and religious clubs more than a decade ago, we “protect our own freedoms by respecting the freedom of others who differ from us.”4 By allowing students to discuss difficult issues openly and honestly, in a civil manner, our schools become forums for combating ignorance, bigotry, hatred, and discrimination. The Act requires public secondary schools to treat all student-initiated groups equally, regardless of the religious, political, philosophical, or other subject matters discussed at their meetings. Its protections apply to groups that address issues relating to LGBT students and matters involving sexual orientation and gender identity, just as they apply to religious and other student groups. Today, the U.S. Department of Education’s General Counsel, Charles P. Rose, is issuing a set of legal guidelines affirming the principles that prevent unlawful discrimination against any student-initiated groups. We intend for these guidelines to provide schools with the information and resources they need to help ensure that all students, including LGBT and gender nonconforming students, have a safe place to learn, meet, share experiences, and discuss matters that are important to them. Although specific implementation of the Equal Access Act depends upon contextual circumstances, these guidelines reflect basic obligations imposed on public school officials by the Act and the First Amendment to the U.S. Constitution. The general rule, approved by the U.S. Supreme Court, is that a public high school that allows at least one noncurricular student group to meet on school grounds during noninstructional time (e.g., lunch, recess, or before or after school) may not deny similar access to other noncurricular student groups, regardless of the religious, political, philosophical, or other subject matters that the groups address. I encourage every school district to make sure that its administrators, faculty members, staff, students, and parents are familiar with these principles in order to protect the rights of all students — regardless of religion, political or philosophical views, sexual orientation, or gender identity. I also urge school districts to use the guidelines to develop or improve district policies. In doing so, school officials may find it helpful to explain to the school community that the Equal Access Act requires public schools to afford equal treatment to all noncurricular student organizations, including GSAs and other groups that focus on issues related to LGBT students, sexual orientation, or gender identity. Officials need not endorse any particular student organization, but federal law requires that they afford all student groups the same opportunities to form, to convene on school grounds, and to have access to the same resources available to other student groups. The process of revising or developing an equal-access policy offers an opportunity for school officials to engage their community in an open dialogue on the equal treatment of all noncurricular student organizations. It is important to remember, therefore, that the Equal Access Act’s requirements are a bare legal minimum. I invite and encourage you to go beyond what the law requires in order to increase students’ sense of belonging in the school and to help students, teachers, and parents recognize the core values behind our principles of free speech. As noted in our October 2010 Dear Colleague Letter and December 2010 guidance regarding anti-bullying policies, I applaud such policies as positive steps toward ensuring equal access to education for all students. Thank you for your work on behalf of our nation’s children.